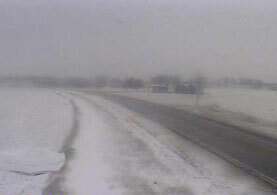 DOT traffic camera view on Highway 10 near Alton. The season’s first snow storm, combined with the strong winds with 40-mile-an-hour gusts led to some power outages and problems on the roadways in northwest Iowa. More than a dozen incidents have been reported to the Plymouth County Sheriff’s Office of vehicles either sliding into the ditch, or, because of the strong winds, were blown off the roadway. One such incident involved a semi that left the roadway in the northeast corner of Plymouth County near 120th Street and county road K-22. A Fed-Ex delivery truck also took to the ditch near Kingsley. In each of the reported accidents, there were either minor injuries, or no injuries. The Plymouth County Sheriff’s Office even had a report of a roof that had blown off a building onto county road C-60 near Noble Avenue.